So I'm going back in time to last May when my fiance and I traveled down to the Chattanooga area. I could write a novel about all the interesting places we visited while there, but for now I'd like to focus on Signal Mountain. Just north of Chattanooga on Walden's Ridge, Signal Mountain was used during the Civil War as a communications spot where Union soldiers maintained a signal line. In 1913, a streetcar line was extended to Signal Mountain and the Signal Mountain Inn was erected. This Inn catered to those on their way to Florida, and as a result, a resort town was formed. As we drove up the mountain, we were struck by the quaintness of Signal Mountain and its densely clustered lots comprised of early 20th century architecture. We stopped at a park called Signal Point that commemorates the Civil War history of the mountain. 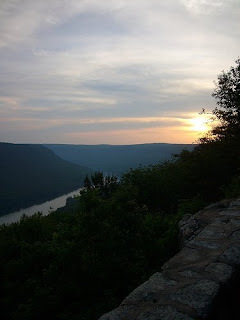 From here, you overlook one of the most stunning views of the Tennessee River Gorge (which happens to be protected by the Tennessee River Gorge Trust). We happened to go at sunset and it was truly spectacular. 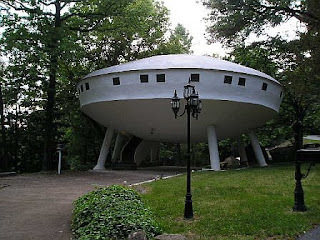 While on Signal Mountain, you would be remiss if you didn't stop and check out the "Spaceship" house located along Highway 127 inside a hairpin curve. The Spaceship house was built in 1970 and surprisingly is almost 2000 square feet. Just this year it sold at auction. I'd love to see the interior-if only it were open to tours! There's so much more to post about my experiences in the Chattanooga area, but its nearly 9:00 pm and this ole' gal needs to wind down before going to bed. I'll be going back to the area next weekend since Brian will be cycling 100 miles for the Three State/Three Mountain event. You can bet I'll be taking my camera. Hey, I ran across your blog --Cool blog -- keep posting! I am from Chattanooga -- and I love to see weird TN places! I LOVE the spaceship house! We run a blog called www.TheTravelingTwosome.com where my wife and review places off the beaten path! We've got to check this place out and get an invite inside!